Your doctor will evaluate your condition based on your symptoms and physical examination. X-ray of the knee may be taken to make sure there is no problem involving the bones or a bone spur around the knee. 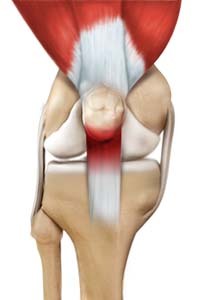 An MRI scan can reveal degenerative changes in the patellar tendon. A knee support or strap (called an intrapatellar strap or a Chopat strap) can be worn to relieve pain by directing the force away from your tendon. Iontophoresis, a technique where a topical corticosteroid medication is applied to the affected area with the help of a small device that uses an electric charge to deliver the medication through your skin. Corticosteroid injection administered under ultrasound guidance may be given directly into the sheath around the affected patellar tendon. This helps to relieve pain and enable you to perform strengthening exercises without any pain. In rare cases such as when there is persistent pain despite of the other treatment options, surgery may be considered. Surgery involves removal of the severely damaged parts of your tendon and repair of any tears in the tendon.